Wind tunnel technologies have come a long way since the late 1970's when the first wind tunnel designed for human flight was created. (see article: History of Vertical Wind Tunnels) Most early machines designed for human flight employed a simple propeller below design. These designs often caused the size (diameter) of a wind tunnels flight chamber to be tied to the size of the prop. As you can see when browsing propeller below designs in our wind tunnel database - the average diameter of the flight chamber for these type of designs usually fall within the 8-12 foot (2.4-3.7 m) range. It is easy to see that since these early designs, vertical wind tunnels have come a long way. What does the future of vertical wind look like? In order to take a look forward, lets first take a look back. The simplicity of propeller below designs allowed them to be easily applied in both permanent and mobile designs. Examples of these locations can still be seen today. Propeller below models have been helping people fly since the late 1970's. As time passed, open flow and finally recirculating wind tunnel designs grew in popularity. The closed loop design allow recirculating wind tunnels to be constructed in any climate and operated year round. As these recirculating models improved, a focus was put into reducing the external noise. Being quiet/silent from the outside enabled wind tunnels to be constructed almost anywhere. Now, permanently installed recirculating wind tunnel installations have risen to become the norm. If you need, brush up on the types of vertical wind tunnels. Most modern tunnel designs employ a bell shape just before the flight chamber to force moving air through a smaller opening. This technique has allowed tunnel manufacturers to build larger flight chambers. A larger flying area is almost always desirable as it gives a flyer more freedom to move and allows more simultaneous flyers. It is no surprise that as the technology improved that manufacturers began building larger and larger tunnels. As the size of a flight chamber grows, the costs to build and operate also grows. During the evolution process a 14 foot (4.3 m) wind tunnel became the average size for modern wind tunnels. This size allowed for multiple flyers to fly comfortably while still maintaining a reasonable power consumption for running a wind tunnel business. A modern, permanently installed, recirculating wind tunnel facility of an average size starts somewhere around 10 million dollars or more to construct. Wind tunnel businesses of this size, cost and require a considerable surrounding population to support the business. With a few exceptions, most modern day recirculating wind tunnels are located near large cities. Usually each location is immediately surrounded by at least 1 million people if not somewhere into the 2-3 million range. Wind tunnel companies are rushing to capture prime locations world wide. We are now seeing cities with multiple wind tunnels, and the trend looks to continue. The future for the wind tunnel industry is going to be extremely interesting. So far, most wind tunnels have operated with little to no competition. However, the industry is maturing at a rapid speed. The future will see a decreasing number of remaining prime locations, an increase in competition, and a changing market. We are witnesses to this ever changing market, and are seeing trends that will continue to shape the indoor skydiving industry. As part of the effort to operate at lower costs, smaller wind tunnels are gaining popularity. 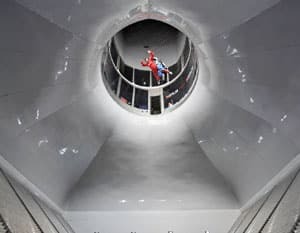 Smaller wind tunnels can effectively service smaller markets and provide a great experience for first time flyers and a percentage of skydivers. By utilizing the technologies developed in a smaller package, the flight experience is maintained while only reducing the size of the flight chamber. Mature companies like SkyVenture are beginning to construct a larger number of smaller scale wind tunnels. 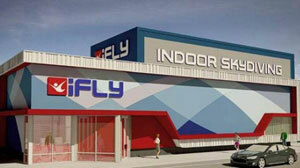 For example, many recirculating, 12 ft (3.7 m) iFLY branded locations are under construction. These smaller tunnels are being built in addition to their already high number of 14 ft (4.3 m) models. New companies focused around the construction of smaller wind tunnels are also popping up. For example, the Russian based company Tornado focuses on creating smaller wind tunnels. Tornado is creating both smaller scale recirculating and mobile designs. A new breed of wind tunnels are beginning constructed. Early mobile designs had noise and mobility issues. 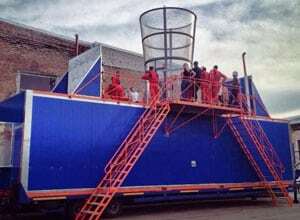 Russian manufacturer Tornado has been leading the charge to improve the technology of mobile wind tunnels. There is a big market that the large, multi-million dollar projects neglect to cover. This new breed of mobile wind tunnel is here to serve that market. The improvements made to this new style of wind tunnel enable a wide range of applications. The lower price point (under half a million dollars) opens the pool of possible ownership. This type of wind tunnel will start showing up public events, amusement parks, seasonal locations, and potentially see private owners. New manufacturers are entering the arena with improved designs and new ideas. Competition and new design will bring with it an improved flight experience and more efficient operation. How much more efficient these wind tunnels will become, and how radically the designs will change, are left to be seen. Notable examples of new companies include Eydisa who is building their first location in Madrid, Spain. Tunnel Technologies also just arrived on the scene and they bring a newly designed wind tunnel, the first of which will be completed in 2016. It also wouldn't be surprising to see efforts being made to optimize the performance and energy usage of existing locations. We would love to hear what you think the future holds for vertical wind tunnels and indoor skydiving in the comments below.